1. The Female Athlete Triad.- 2. Nutritional Recommendations for the Young and Aging Female.- 3. Women’s Bone Health: Breathing Life into the Skeleton.- 4. Upper Limb Nerve Entrapment Syndromes.- 5. Lower Limb Nerve Entrapment Syndromes.- 6. 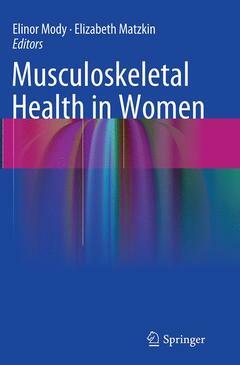 Osteoarthritis and Gender-Specific Joint Replacement.- 7. Nutraceuticals: An Alternative for Osteoarthritis Management.- 8. Alternative Exercixe for Women.